Since we installed the Watt&Sea POD 600 in Las Palmas, we’ve sailed more than 2’500 nm with it. Some people have been asking for feedback on it, so here it is! Watt&Sea hydro-generators have been out for many years, but this winter they made a different and new version of it, called ‘POD’ (like the electric pod drives on big ships) , this version is designed to be installed under the hull. It’s fixed, installed behind the keel and is turned on and off by a switch (controlling a relay). Just like the other hydro-generators from W&S, it comes with a charge controller (they call it le converter 🙂) that can handle various types of batteries, various battery voltage (12V, 24V or even 48V) and that has also an input for the solar panels. Why did we got one? On our winter passages from Portugal to Morocco and the Canaries islands (end of December 2017), days were shorts and cloudy (and nights soooo long). We could not sail more than 24 hours without running the engine to charge the batteries – which took forever and is uncomfortably noisy. At the end of a night, we had typically -100 Ah to recover which would take around 3 to 4 hours with our 80 A alternator: the charges starts at 40 A, then it slowly decreases over the time to 30 A, 20 A and then 10 A – which is how alternator work. Charge boosters for alternators do exists, they act like a proper battery charger (they are installed between the alternator and the batteries – maybe in another post). An alternator is not a proper charge controller on its own, in the long run you can damage your batteries if you cycle them (i.e. empty them and charge them) with the alternator all the time. With the POD, even in the event we don’t produce enough energy over the night, we have much less to recover. And if we sail fast enough, we keep the batteries charged and the crew can enjoy films and music 24/24 🙂 – see below. It’s was easy to install, at least more easy than fixing the two traditional supports on the transom – but the boat as to be on the hard for that! We decided to get the POD because it leaves the transom free for whatever we wanted (davits and dinghy, etc.) and that activating it is just the matter of pushing a button (nothing to install or drop into the water while sailing). You’ll need to run cables, connect the input cables (hydro, solar) to the specific Watt&Sea connectors. A few extra small electrical hardware (Wago® connectors, some classic connectors, a switch, more electrical cable…) is needed to plug the relay. Then, you’ll need some battery cables to connect the charge controller to the batteries. I did not use a circuit breaker between the charge controller and the batteries – I am afraid that it has the potential to do more harm than good (if you break the connection to the batteries while charging, you most probably will burn the charge controller), but that may be just personal. Also, I install the switch to turn it on/off in the cockpit instead of at the chart table. It’s easier to turn it off before starting the engine. You have to use a paint designed for aluminium drives otherwise you’ll get electrolysis between the aluminium and the copper contained in most classic anti-fouling paints. After five months, the paint on the POD and its plastic propeller is still looking good. Actually, the POD looks in better shape than the sail-drive that I painted the same way at the same time. It works great. I have the feeling that our solar panels work better with it than with our Victron Energy MPPT charge controller – it could be just a feeling. We have 2 x 120 W solar panels and we are at the upper limit of the solar input capacity on the charge controller (max 50 V and 14 A). I prefer to use only one controller (we have a spare MPPT controller just in case this controller fails) because, maybe, by having two separate controllers (one for the solar panels, one for hydro-generator) they would be ‘fighting’ over the bulk/absorption/float voltages. Different controllers usually have different settings – close, but slightly different. The charge controller as two outputs for two battery banks (that is nice!). We have decided to charge the service battery bank and the engine’s battery (and not the windlass’ battery). I guess it respects the values announced by Watt&Sea. It certainly changed the way we sail because we can now have the computer running inside full time. Around and below 4 knots, we don’t really notice a charge. Around 5 knots, if we are careful, we can keep the battery in good shape, and the solar panels can recharge quickly the next day. At 6.5 or 7+ knots, we have to stop the hydro-generator when the batteries are full, we can not consume all it gives. Basically, we don’t run the engine anymore to charge the batteries… as long as we are moving with the wind. It does makes noise inside when in use (but much less than the engine, for sure). When I’m not on my shift, I usually sleep on the saloon floor boards (right above the POD)… and the noise is totally OK for me. Also, when we can hear it, it’s the happy sign that the batteries are charging. After some nights, I was able to tell our speed by the meows of the POD. The noise is nothing bad, just keep in mind that it is not silent. On our Hanse 430e, there is a perfect spot to install the POD, right behind the keel in a specific bilge, 1 meter away from the batteries. I cannot see a more protected and convenient place, even on other boats. 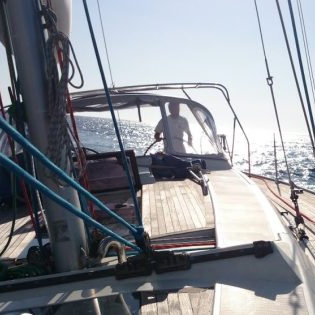 From Canaries islands to Greece, we have sailed around 20 nights and 2’500+ nm, both offshore and close to land and we never got anything in it – touching wood. We’ve sailed across some waters full of drift wood and others with some floating balls of weeds… but nothing got down there. The POD is in the lowest point of the hull (70 cm I would say), and is well protected by the keel. It happened that we stopped the POD a couple of times at night because we felt the sea was not really safe (nets) – we would have avoid motoring there as well. We are satisfied with it, if like us you don’t like running the engine on passages, this is a nice solution to get energy at night (or cloudy days). Sailing speed is definitively important. We can be rather frugal on Soledad by shuting down most electrical devices (see our installation) (for that, we would keep only half of the cockpit instruments, the auto-pilot, the AIS and the fridge – and that’s really all, not counting handheld devices) but even like that, 5+ knots are required to keep the batteries mostly happy (6+ knots for the crew to be happy), which is slightly higher than what Watt&Sea claims: “4 – 5 knots to be self-sufficient” – which does not mean a lot in itself, since it really depends on your power needs. Should you have questions, feel free to ask in the comment down below! Thanks for your information Pierre-Olivier. I am just about to buy a POD 600 for my Bermuda 52. I was a little worried about the noise as “noise” is a bit hard to describe and is kind of a “personal taste” sort of thing. Would you consider it an irritating noise and does it make it hard to sleep while it is running. I will probably buy it anyway as using the engine on my boat is something I would prefer not to do. The sound of silence (or a whirring POD 600) is always better. Also, I gather that when the generator is turned off, the prop stops. Did you notice any significant increase in drag when it is off. Hi Dennis. I’m glad you find this information useful. With regards to the “noise”, I always could sleep perfectly fine right on top of the POD while sailing (I sleep on the saloon floor when I keep my nav cloths and harness to be ready to go and help on deck). In the cabins it’s a very light sound, and from up on deck it’s really hard to hear. Of course, it’s something very personal… but still nothing comparable to running the diesel engine! Given the size of the prop, I am not worried about locking the prop, the drag is negligible. Plus, we have it spinning as soon as solar panels no longer produce anything useful (i.e. half of the day).